Ivy League basketball! Always a thrill. There’s no excitement quite like watching the lone team of intellectuals in the NCAA do battle in the opening round, facing some relentless Power 6 titan and seeking glorious victory using only their wits and old-fashioned fundamentals. Nothing flashy. Just good American grit, underhand free throws, and special calculators to determine the perfect angle of ascent for a jump shot. That’s the idea, anyway. Somehow, the Ivy League schools that are synonymous with elitism and the liberal upper class during political season become plucky American underdogs battling the juggernaut in March. Remember when Princeton beat UCLA in ’96? If not, Time magazine ran a feature about it. When an Ivy League school beats one of the most famous programs in the country, you can bet Time is all over it. And so were we. I don’t actually remember where I watched the game, but I probably should. Instead, I have a vague memory of middle-aged white men doing backflips every time Princeton got another layup on a backdoor cut. And these were dudes who had never done a backflip in their entire lives. My dad seriously injured himself, actually. There was also that time Cornell made the Sweet 16 two years ago, but I think the majority of America failed to realize that Cornell was an Ivy League school until it was too late. It’s a fascinating spectacle, for reasons that aren’t easy to define. Maybe it’s because we associate the schools with academics, and it’s fun to watch them go against type. They don’t even give out athletic scholarships, though there are work-arounds involving need-based scholarships and flexible admissions policies for coveted athletes. Maybe it’s because most of us see ourselves as Ivy League-type players, which is to say, not good but maybe kinda clever on the court. And that’s nonsense, but this is America, and we’re allowed to entertain severe delusions about ourselves. Anyway, today’s primer was a choice between the four teams who clinched a berth Tuesday night: Detroit, South Dakota State, Western Kentucky, and Harvard. South Dakota State and Western Kentucky will almost certainly lose in the first round. Detroit is a fun Horizon League team with an exciting sophomore guard in Ray McCallum. 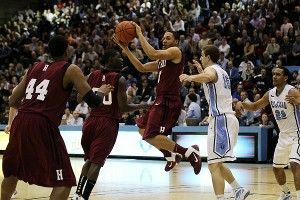 But Harvard is the better team in the end, and even if it weren’t, the Ivy League allure would be too hard to resist. So let’s figure out the Crimson, Q&A style. Q: Whom did Harvard beat in the conference tourney? A: Not so fast, amigo. The Ivy League is the last Division I conference that gives its automatic berth to the regular-season champion. Harvard clinched last night when Penn lost at Princeton. If Penn had won, it would have forced a one-game playoff with Harvard to decide the conference champion. Q: When was the last time Harvard made the tournament? A: 1946. That year, all college-aged men were still coming home in boats from WWII, so Division I basketball was played by women. They made a movie about it called A Harvard of Their Own, starring Lady Gaga as Jeremy Lin. Q: What Harvard-related name did they call the community college or state school in your hometown? A: North Country Community College in Saranac Lake, New York, was called “Harvard on the Hill.” Yours in the comments. Q: Basketball time. Who’s the coach? A: Former Duke standout Tommy Amaker, who previously coached at Seton Hall (resigned) and Michigan (fired) after serving as an assistant under Coach K for nearly a decade. This is his fifth year at Harvard, and after going 8-22 in his first season, his teams have steadily improved. Last season, they made the NIT before losing to Oklahoma State. Now they’re dancing. Q: How strong is this team really? Pretty strong, actually. KenPom has the Crimson 38th in his ratings, making them the ninth-best mid-major in the tournament by that metric. Joe Lunardi has them as an 11-seed in the latest Bracketology, and you wouldn’t expect them to fall any lower than a 12. They particularly excel on defense, where they hold opponents to the 27th-lowest effective field goal percentage in the country, and keep teams off the offensive glass at the 15th-best rate. But how much of that is their own ability, and how much is just playing in a weak-ish conference? For that, we can look at non-conference games. Harvard beat Florida State in November, a high-quality win, lost to UConn by 14, beat Central Florida and St. Joe’s, but suffered a pretty bad loss to Fordham. So what do we know? That they can beat good teams and lose to bad ones, I guess. But an important point to note is that Harvard has limped to the finish line. After beating Princeton by three, it lost to Penn at home and finished with narrow wins over weak opponents in Columbia and Cornell. As late as Week 14 (February 6), Harvard was ranked in the AP Top 25 poll. A loss at Princeton ended that for good, and the end of the season hasn’t inspired much confidence. Q: What about the players? A: The signature of this team is defense, so it shouldn’t come as a surprise that Harvard’s leading scorer, 6-foot-7 junior Kyle Casey, averages just 11.3 points per game. The only other player in double figures is 6-foot-8 senior Keith Wright, who puts up 10.7 points and 8.1 boards per night. Other than that, they’ve got a lot of workmanlike workhorse worker bees, though Laurent Rivard, a 6-foot-5 senior, shoots 39 percent from 3 and averages 9.7 points per game. Wright and Casey are the only two Crimson players with any height, and as good as they are on the defensive glass, they don’t create many second chances for themselves on offense. But they attack well and get to the line at an impressive rate, and the hope is always that defense will sustain them. A: A little rough. As always, the matchup will dictate a lot, but in terms of momentum there’s not much to be said here. Even so, they have won 26 games, and four of the five starters are upperclassmen. Maybe that’ll be good enough in a tense first-round game, but I’ll probably be penciling in the opponent. Wait a second, how can I end this negatively? This is the Ivy League! I need to go out dramatic. Cue up the Last of the Mohicans theme music. a Harvard of Our Own. Who Is This Year's [Insert Free Agent Here]?